The Jornada Nacional de Investigación, Regulación y Desarrollo de la Investigación Científica was held in Quito, Ecuador, from September 13 to 15, 2017, organized by the Ministerio de Salud Pública (MSP), with the support of the Pan-American Health Organization (PAHO/WHO) and the Latin American and Caribbean Center on Health Sciences Information (BIREME). 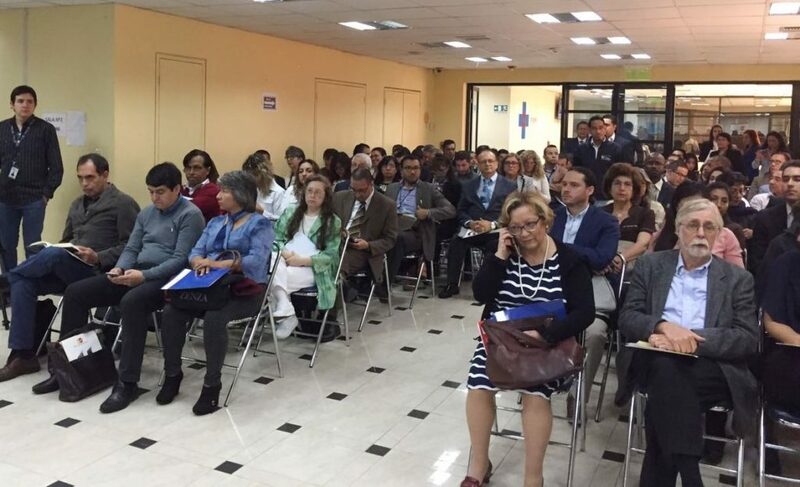 The directive panel was headed by the Minister of Health, Dr. Verónica Espinosa, the General Coordinator of Strategic Health Development of the MSP, Economist Ruth Lucio, the PAHO/WHO Representative in Ecuador, Dr. Gina Tambini, and BIREME Director, Dr. Diego González. The key objective of the event was to generate input for the design of policies, strategic guidelines and norms to strengthen the development of scientific research in health nationwide. In addition, to contribute to the publication of study and research results related to health systems, facilitating use of and access to relevant information for decision-making processes. Dr. Espinosa made a call to foster research in health and highlighted the importance of these resources and of scientific evidence for decision-makers. She closed by thanking the PAHO/WHO support in the country and the presence of BIREME in the event. At her turn, Dr. Tambini mentioned that “quality research is paramount to accomplish equity, health, economic development, and to attain the Sustainable Development Goals.” She added that countries need sustainable research systems if they want to improve the health of their populations and reduce inequalities and social injustice. About the importance of the event, which started in the MSP facilities, she said that development of health research was paramount and that results should be available to other researchers and decision-makers, who use scientific evidence to make decisions in public health. She also referred to the re-launching of the Virtual Health Library in Ecuador (VHL-Ecu). “The VHL is a decentralized and dynamic collection of sources of information that offers equitable access to scientific knowledge in health.” It operates as a content management network, aiming to progressively meet the needs for health information. As part of the first day of the event, Dr. González presented “BIREME’s role in Latin American research”, highlighting the importance PAHO/WHO places on research. He also presented the information resources the Center develops to give visibility to the scientific information generated by research, and highlighted the Virtual Health Library and LILACS, as well as a recently-launched new product, MiVHL, which enables users to create their own collections. Professionals from the MSP; Secretaría de Educación Superior Ciencia, Tecnología e Innovación (SENESCYT); Consejo de Evaluación, Acreditación y Aseguramiento de la Calidad de la Educación Superior (CEAACES); Instituto Nacional de Investigación en Salud Pública (INSPI); Agencia Nacional de Regulación, Control y Vigilancia Sanitaria (ARCSA); universities; research journals and researchers took part in the Jornada Nacional de Investigación, Regulación y Desarrollo de la Investigación Científica en Ecuador. The event included meetings, panels and lectures about research. Also, there was a workshop on access to scientific information, facilitated by Elisabeth Biruel from BIREME/PAHO/WHO, and a workshop on scientific communication presented by PAHO/KBR consultant, Dr. Damián Vázquez, editor-in-chief of the PAHO/WHO Pan American Journal of Public Health. The workshop on access and use of scientific information focused on critical, conscious and judicious use of scientific evidence for decision-making in health, highlighting VHL/Ecuador and other sources of information, including references for health assessment – GRADE System. The workshop on health communication and scientific writing presented the norms of scientific writing and how to publish scientific articles, including the publishing process, editorials, reviews, authorship and impact, journal dissemination and indexation. The workshops were developed in the scope of a broader strategy of joint work with the Ministry of Health, with the objective of strengthening research and the publication of research results, as well as bringing visibility to Latin America and the Caribbean. 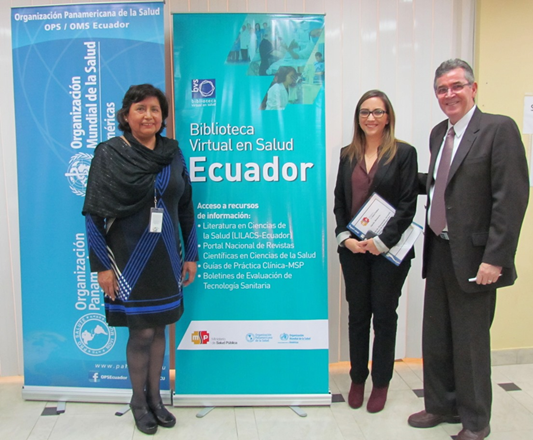 BIREME/PAHO/WHO will support and monitor actions to improve VHL/Ecuador and to strengthen access to and use of information, by means of online courses available at PAHO/WHO Virtual Campus for Public Health. 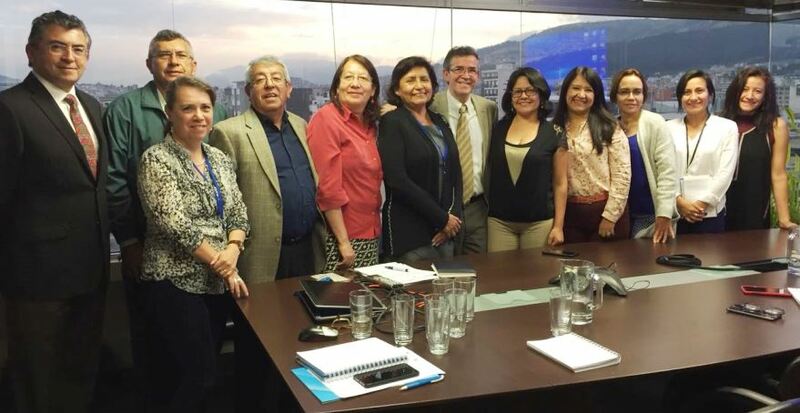 The presence of BIREME employees in Ecuador was an opportunity to generate an exchange amongst professionals, both from PAHO/WHO in the country, and coordinators of the VHL National Network. Source: PAHO/WHO Ecuador. OPS/OMS y BIREME apoyan al Ministerio de Salud en la Jornada Nacional de Investigación Científica. 2017. Available at: <http://www.paho.org/ecu/index.php?option=com_content&view=article&id=1960:ops-oms-y-bireme-apoyan-al-ministerio-de-salud-en-la-jornada-nacional-de-investigacion-regulacion-y-desarrollo-de-la-investigacion-cientifica&Itemid=360>. Accessed on: sept 26, 2017.